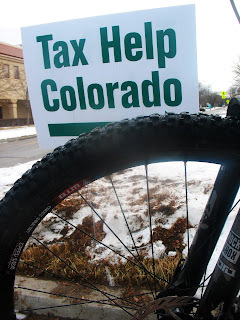 The only two things guaranteed in life are bikes and taxes. It's tax season, and soon the IRS will be waiting to get a hold of some of your money. Although you can't directly get money back during tax time for riding your bike, you can be reimbursed for bicycle commuting costs throughout the year. The reimbursement is provided by employers to employees in exchange for tax breaks for the employers. As an employee, if you are a bicycle commuter, you will qualify for up to $20 per month for expenses incurred while bicycle commuting to work. For more information on Commuter Reimbursement, visit the American League of Bicyclists.